(CNN) - Human error is blamed for a false alarm of a missile heading for Hawaii, but the scare left Americans wondering how the missile detection and emergency messaging systems are supposed to work -- and what went wrong. The US military is in charge of detecting ballistic missile launches and maintains a complex and integrated network of sensors and detection capabilities in the Pacific to follow missile activity, a network that has been improved in recent years. Missile launches are detected immediately by satellites that notice the infrared signature on the launchpad. The detection triggers an instant Strategic Command, or STRATCOM, assessment process. The assessment looks at where the launch is, the potential type of missile, trajectory, apogee, distance and potential targets in the path of the missile. Top military commanders join a conference call, with the top priority being to decide whether the missile is a threat to the US or its allies. If the missile is a threat, the president is brought in and response decisions are made. NORAD (the North American Aerospace Defense Command), STRATCOM, intelligence agencies and the National Security Council are involved in the decision-making. Even if the missile is not a threat, the president usually is notified quickly, while missiles are still in flight. The United States has not had to make a direct military response to recent North Korean launches because it's been assessed they posed no threat to the United States. If they did, missiles on ships in the Pacific, or other land-based missiles, could be launched to try to shoot down an incoming missile. The military shares all tracking and verification with civilian authorities. Hawaii's emergency management system relies on the military because it does not have detection capability on its own. Hawaii has a three-component emergency notification system, according to the Hawaii Emergency Management Agency. The first part of that system is that outdoor warning sirens sound a one-minute Attention Alert Signal, or a steady tone, that informs residents to turn on a radio or television for information. That is followed by a one-minute Attack Warning Signal, or a wailing tone, that directs residents to seek immediate shelter, according to the agency. At the same time, the Emergency Alert System would use Hawaii's broadcast industry -- such as cable TV and wireless cable -- to send an emergency message. This type of system is used with AMBER alerts or in weather emergencies, according to the Hawaii Emergency Management Agency. In December, Hawaii began monthly testing of a nuclear warning siren system that would be used in case of an impending nuclear missile strike. The tests use both of the above systems. The most recent test was January 2. In the case of a real emergency, those two pieces would be joined by alerts from the Wireless Emergency Alert system. That system delivers sound and text warnings to mobile phones, according to the agency. Saturday, the Wireless Emergency Alert system and the Emergency Alert System were used to warn of the false missile threat. However, there were no reports of sirens going off in the state. Hawaii Gov. David Ige said human error caused the false alarm. "It was a mistake made during a standard procedure at the changeover of a shift and an employee pushed the wrong button," Ige said. The warning went out to cell phones, television and radio, he said. On Sunday, Vern Miyagi, the Hawaii Emergency Management Administrator, elaborated on what went wrong. During the drill, the computer asked the officer to confirm it was the message that was supposed to be sent. After clicking "yes," the message made its way to the entire state, Miyagi said. At the time, there was no template prepared to relay a message that the prior alert had been a false alarm, Miyagi told CNN's Sara Sidner. As of Sunday, that has been changed, and a false alarm template has been added. A second emergency alert saying there was no incoming missile was sent to phones in Hawaii 38 minutes later. The speed of a warning is critical for the Hawaiian islands, located about 4,600 miles from North Korea. The state would have about a 20-minute heads-up before a potential missile launch from Kim Jong Un's regime hit the islands. 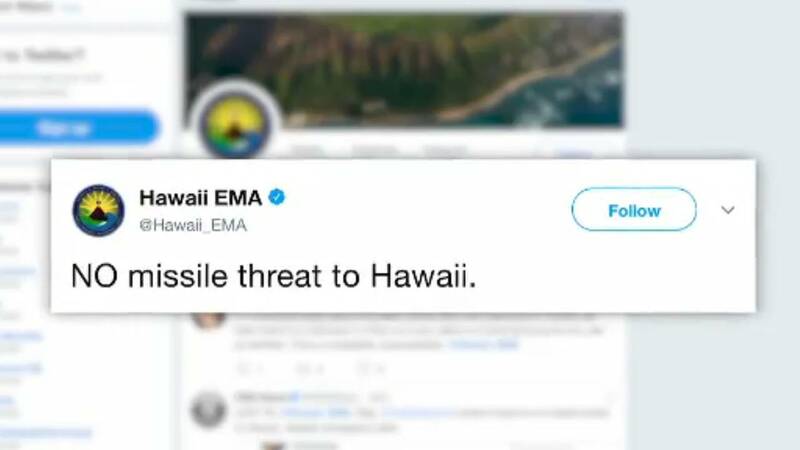 "Pacific Command would take about five minutes to characterize a launch, where the missile is going, which means the population would have about 15 minutes to take shelter," said Vern Miyagi, administrator for Hawaii's Emergency Management Agency. "It's not much time at all. But it is enough time to give yourself a chance to survive." Given the time concerns, Hawaii's emergency plan does not call for a mass relocation or evacuation. Residents are instead instructed to go inside and remain sheltered for up to 14 days or until they are told it's safe to leave. More than 90% of the population would survive the immediate effects of a nuclear explosion, according to the Hawaii Emergency Management Agency. Taking shelter could protect survivors from residual radiation from nuclear fallout. Officials would then use AM-FM broadcast radios to provide information, the agency said. Indeed, the false alarm on Saturday told Hawaii residents to "SEEK IMMEDIATE SHELTER." Hawaiians rushed to areas with some physical protection. Some guests at hotels across the Hawaiian Islands were instructed to go to hotel basements after the false alert was sent out. Hawaii state lawmaker Kaniela Ing told CNN he had heard stories of people making tearful goodbye calls, and he said that a family had taken shelter in the sewers.